Tibor Szakacs was born in Budapest, Hungary and his early career was spent as an Army Officer in his native country. Tibor was a refugee of the Hungarian uprising and fled to the UK in December 1956. 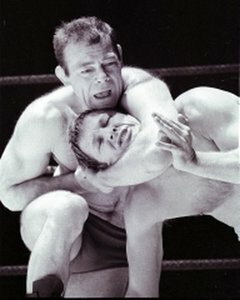 On arriving in the UK Tibor continued with his amateur wrestling career which he had been successful with in his home country but hankered after joining the professional ranks. After spending several months touting his skills around the UK Tibor was finally given his big break by Joint Promotions and would become a loyal employee staying with them right up until his retirement. 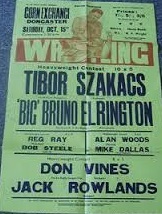 In 1957 Tibor had his first professional bout in Ramsgate against Billy Joyce and right from the outset the fans could see that TIbor was a no nonsense wrestler and he soon became famous for being dour and never smiling during his matches, in fact grimacing most of the time, he quickly became a favourite for his classically trained abilities, his skilful holds and counterholds and suplexes. He also earned a reputation as a specialist in back hand chops and flying tackles. On the 22nd January 1960 Tibor was to be given his first taste of national exposure when he appeared on a televised presentation from Wembley against Billy Howes. This was to be the first of many televised appearances for Tibor over the next 20 years where he faced all of the top stars of the day including Mike Marino, Ray Glendenning, Sean Regan, Johnny Yearsley, Pat Roach, Roy Bull Davis to name but a few. Although Tibor did not wrestle outside of the UK very often, with the exception of the German tournaments, Tibor was always billed against any heavyweight foreign visitors to our shores and whether it be a fan favourite or a rulebender Tibor would also give 100% commitment and could suit his opponet whether they wanted a technical wrestling match or wanted to consistently break the rules. 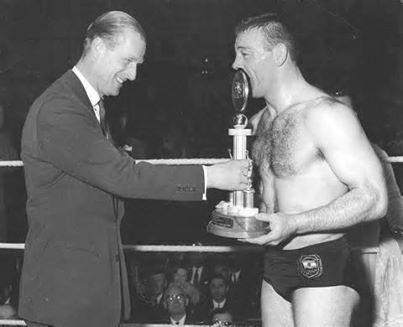 One of the most prestigious nights in British wrestling was the Royal Albert Hall tournament. Tibor was regularly entered into this tournament and he held the record for winning the tournament five times and in 1963 was presented with the trophy by HRH Prince Philip, Duke of Edinburgh. He was prevented from winning it for the sixth time by Bruno Elrington. 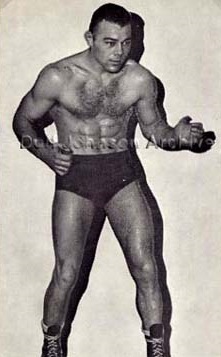 While being a very skilled heavyweight and singles competitor Tibor was also known for his tag team work. 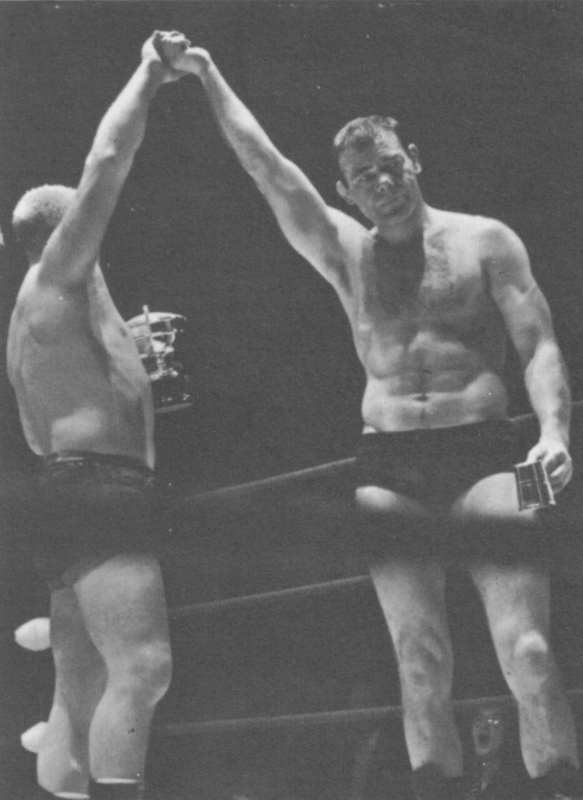 He often partnered Steve Veidor or his brother Peter but his most notable Tag Team appearence was with Henri Peirlot against Count Bartelli and Kendo Nagasaki in 1966. Later that year he had a solo bout against Nagasaki during which he sustained an injury to one of his eyes that left him blind in it and his career never recovered. Despite winning the Albert Hall Trophy a record number of times,Tibor was never successful in winning any championship belts but this did not prevent him from being a fan favourite and one of the most recognisable faces and well respected wrestlers in the UK for 20 years. Like a lot of wrestlers, Tibor entered the licencing trade to supplement his income and was the landlord of Lord Palmerston Public House in the Kings Road, Chelsea where he continued to reside after his retirement form the ring. Tibor Szakacks sadly died on the 5th October 1981 but will never be forgotten by the generations of wrestling fans who he entertained on a nightly basis. We feel that after his many years of loyal service to Joint Promotions and his 5 Royal Albert Hall victories that Tibor fully deserves his place in the Hall of Fame.